polish fixation: indie spotlight: JENSations! Hey guys! Sorry I'm a little late with my post today. It's been a pretty rough week for me so I wasn't able to get anything prepared in advance. Luckily things are going much better for the time being so hopefully I can get myself caught up again soon! Thanks for being so understanding! Anyhow, today I have for you another of my Indie Spotlight posts, and today the spotlight is on JENsations polishes! I have two glitters to share with you today. The first one is called Diamonds are Forever, which I am showing over a black base. Its description is as follows: "a mix of small silver holographic hexagon glitter & large silver holographic diamond glitter in a clear base". This glitter is really sparkly and if you are a fan of diamond shaped glitter you will love this polish, as it is jam packed with them. You definitely are better off using the dab method to apply these glitters to your nail, as it can be a little trickier if you are just trying to paint them on. That is the case for a lot of polishes such as this one so I don't think it's a downside to it, if you are into this sort of look, then it's worth the extra care in getting a nice application. Next up we have Purple Argyle, which I am showing over a lavender base color. The description is: "multi-sized black, white & purple diamonds & black & white bar glitter in a clear base." This is definitely another glitter for diamond lovers. 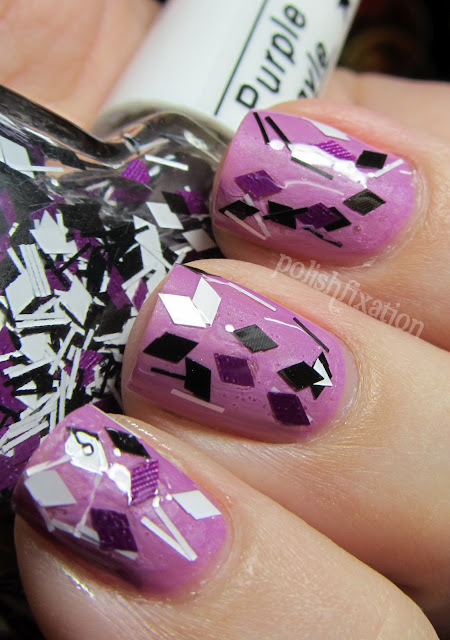 I love the idea of this polish, which as the name suggests, is supposed to remind you of argyle pattern. I think it's a really cute polish! I don't usually particularly enjoy diamond shaped glitters on my nails but this polish really is something different and neat looking. I love the colors of the glitters too. It wasn't very hard to apply at all, as there is so much glitter packed into the bottle. Overall I really enjoyed trying out these polishes by JENSations. She has tons of variety in her shop and I love the little star shaped bottles (which hold 10mL of polish and are easy to store flat side by side). They sell starting from $8.00 a bottle. Check out her Etsy shop to see all the colors she has available to purchase! What do you think of these glitters? 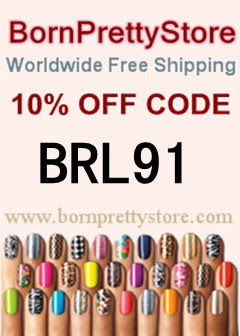 Do you have any polishes by JENsations? 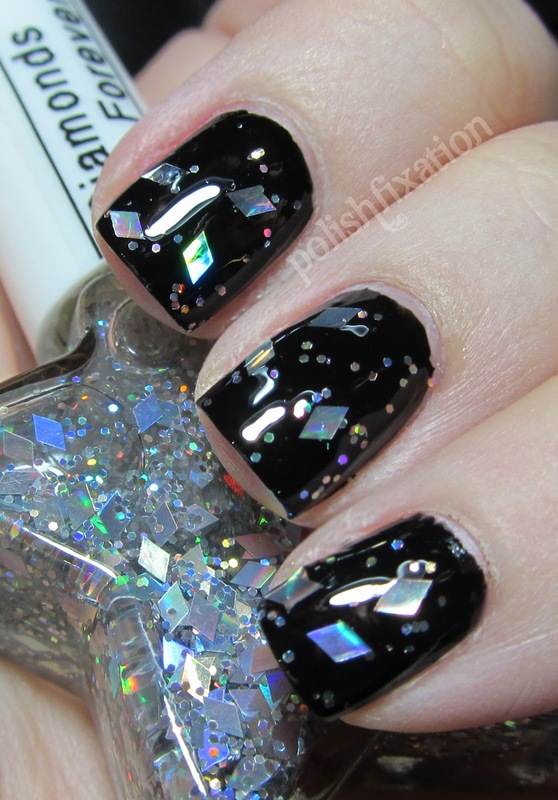 How great are these glitterpolishes! Those are full of awesomeness, I love them both! I've had my eye on these. Thanks for the swatches!